We worked with WDAD Communications to create a career’s website for lastminute.com. The career’s site provides information, in a fun and informal way, for anyone seeking details on job opportunities and associated employment benefits at lastminute.com. 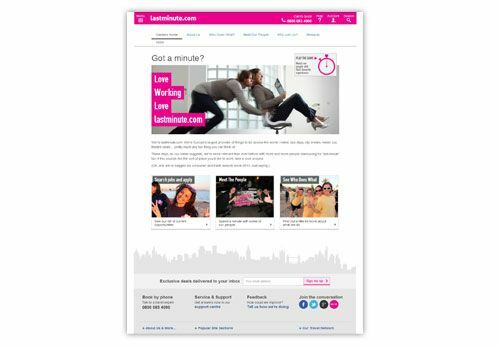 The site adheres to lastminute.com’s branding guidelines and fits seamlessly with the corporate website. The CMS is WordPress and is built using Responsive Web Design so potential employees can access the site on their phone or tablet. Features, such as games, Q&A, and video, enable lastminute.com to engage with their target market.